Common Change is an online app that enables people to host 'generosity dinners' where people come together, share food, pool donations, and then decide who to support with them. Donations can be collected and distributed through the app, in a sort of Gofundme approach. Common Change seeks to model a philosophy of abundance, collaboration, giving/receiving, relationship, and empowerment. You can join a preexisting group, start your own, donate, and download a pdf handbook for starting groups. There are US, UK, and South African websites. Repair Cafés are free meeting places and they’re all about repairing things (together). In the place where a Repair Café is located, you’ll find tools and materials to help you make any repairs you need on clothes, furniture, electrical appliances, bicycles, crockery, appliances, toys, et cetera. You’ll also find expert volunteers, with repair skills in all kinds of fields. Visitors bring their broken items from home. Together with the specialists they start making their repairs in the Repair Café. ​Sacred Kindness - resources (videos, articles, readings, links, study questions) to help you learn more about the gifting economy, inspire you, and make you think. Originally designed to be a 3 month learning experience facilitated by Becky J.Susik, it is now opened up to anyone who is interested in exploring this topic more. ​Rise of the Innerpreneur - award-winning blog by 'innerpreneur' and author of 'Pay What It's Worth', Tara Joyce. The Buy Nothing Project - The Buy Nothing Project began when two friends, Rebecca Rockefeller and Liesl Clark, created an experimental hyper-local gift economy on Bainbridge Island, WA. In just two and a half years, it has become a worldwide social movement, growing to over 280,000 members in 18 nations with 1300 groups and over 1700 volunteers. Our local groups form gift economies that are complementary and parallel to local cash economies; whether people join because they’d like to quickly get rid of things that are cluttering their lives, or simply to save money by getting things for free, they quickly discover that our groups are not just another free recycling platform. A gift economy’s real wealth is the people involved and the web of connections that forms to support them. Organizing a Really, Really Free Market - The RRFM movement aims to counteract capitalism in a proactive way. It holds as a major goal to build a community based on sharing resources, caring for one another and improving the collective lives of all. Markets often vary in character, but they generally offer both goods and services. Participants bring unneeded items and food, as well as skills and talents such as entertainment or haircuts. A RRFM usually takes place in an open community space such as a public park or community commons. Find out how to start up your own market here! ​ServiceSpace - an organization run entirely by volunteers that leverages technology to encourage everyday people around the world to do small acts of service. Their projects range from a daily positive news service to an acts-of-kindness portal and a gift-economy restaurant. This platform allows people to stay connected with others interested in service, participate in service opportunities through any of their dozen projects, organize a local service event using their tools, and stay connected to inspirational content. The Real Junkfood Project - a global, organic network of pay-as-you-feel cafes in Europe and Australia. We divert food destined for waste and use it to create delicious and healthy meals. Starting a Gift Economy - Ideas to help you start your own gift economy projects, such as Give Boxes, Gift Circles, Give and Take Stalls, Really Free Markets, and Free Shops, shared by the Gift Economy Wiki which has articles and posts on 100s of related gifting topics. Shareable - a library of "how to" posts from different contributors giving you hundreds of ways to save money, reduce waste, and build community through sharing (eg. How To Host a Food Swap, How to Make a Street Carfree, How to Share an EBook, How to Start a Worker Coop, How to Travel Without Money...) as well as interactive maps showing sharing resources (rideshares, work spaces, food coops,etc) in your city, and a Sharing Cities Toolkit linking you to every resource imaginable for starting up your own sharing network, gift circle, tool library, timebank, housing coop, free school, workers' coop, etc). Art Hives - An Art Hive is a free community art studio that welcomes everyone as an artist. From an art pop-up in a local library to a community studio or gallery, at its heart, an Art Hive is about inclusion, respect and learning. It's a welcoming place to talk, make art and build communities. Responding in creative ways to things that matter. ​Created by Chris Agnos, the website Sustainable Human creates and showcases videos designed to examine the old stories driving our civilization and to explore alternative stories that can lead us to a new way of living. LNE Convergence 2016 (Bay Area) - plans are underway for this massive conference...this year it will be funded and managed by a cohort of 20 local organizations, planning through consensus. Theme: #blacklivesmatter...looking at the new economy through one of the most marginalized groups in the US. ​One World Everybody Eats - One World Everybody Eats (OWEE) offers an innovative, pay-what-you-can business model that helps communities alleviate hunger at the local level. There are currently 50 community cafes across the United States utilizing this business model, as well as the as well as Panera Bread’s Panera Cares project, with another 20 cafes in the planning stages. Almost all operate predominately with volunteers. Check out the OWEE directory, or download their manual and start your own! The Gift Economy - Genevieve Vaughan is an American expatriate semiotician, peace activist, feminist, and philanthropist, whose ideas and work have been influential in the intellectual movements around the Gift Economy and Matriarchal Studies. Her website provides a discussion of the gift economy and its culture as a way to peace and abundance for all. It distinguishes between gift and exchange, in order to understand them both and to finally phase out exchange altogether. Daniel Suelo - For 15 years Daniel Suelo didn't use or accept money or conscious barter - nor did he take food stamps or other government dole. His philosophy has been to use only what is freely given or discarded and what is already present and already running. In 2015, he took a detour from this lifestyle to live with and assist his aging parents. His father has since passed away and Daniel is still caring for his mother. Daniel now returns to his blog zerocurrency.blogspot.ca with new insights and reflections on a moneyless life. Fruit Tree Harvesting - there are so many urban foraging groups we can't list them all here! People have a tree with so much fruit they don't have time to harvest it. They list it - others pick it - both reap the benefits. 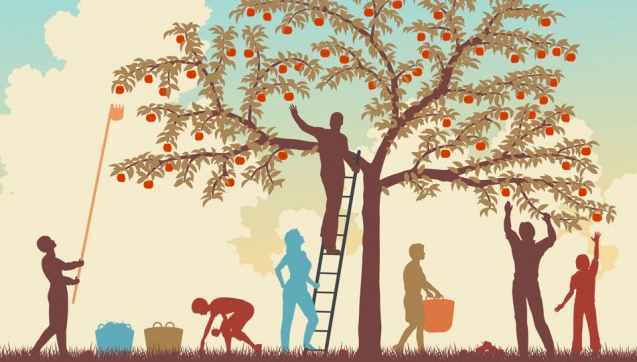 Google your city name and the words "fruit tree harvest" or "fruit tree project" - you're likely to find something, if not in your immediate town then at least in a large city close to you! Here is a list of some of the major fruit tree projects in Canada.